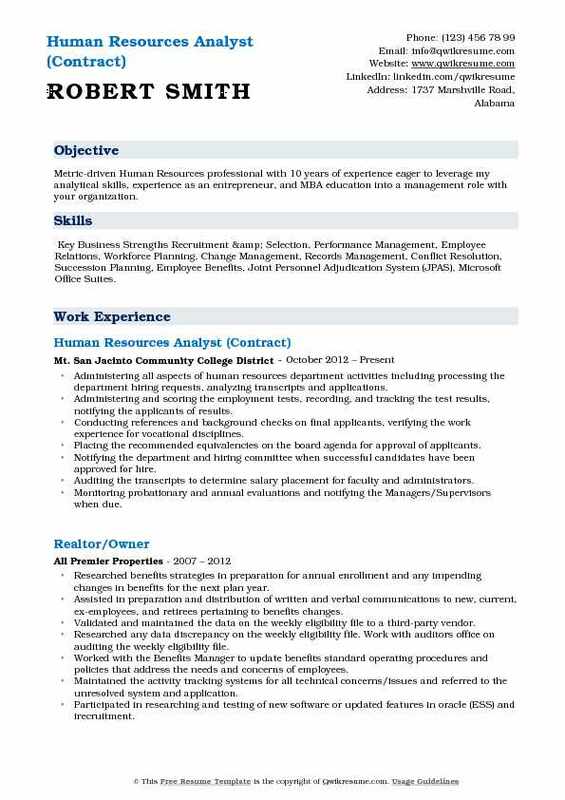 The Human Resources Analyst takes charge of performing human resource administrative work of the organization and provides a detailed analysis of various human resources with its initiatives. 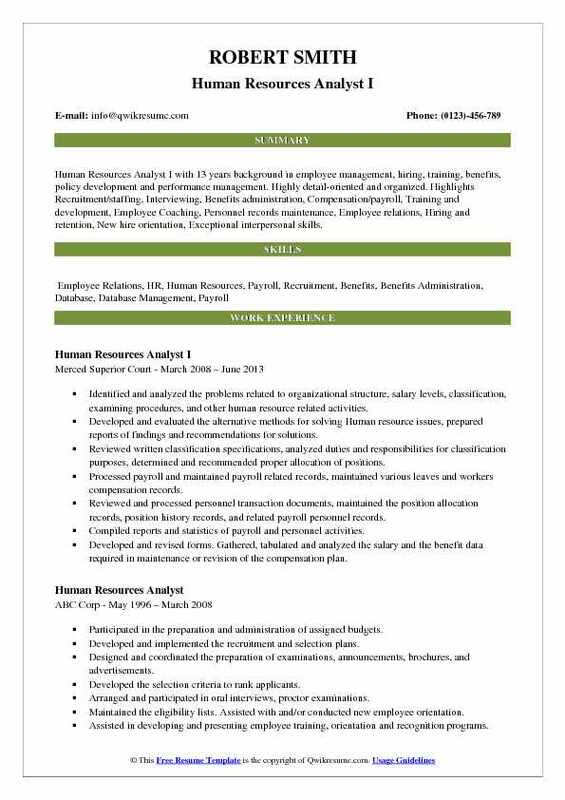 The chief job responsibilities for a Human Resource Analyst contains – administration of assigned functions like recruitment, leaves, benefits, compensation studies, and classification reviews, collecting and analyzing data, assisting in payroll administration, tracking records, performing competitor research, reviewing and interpreting policies or programs and so on. 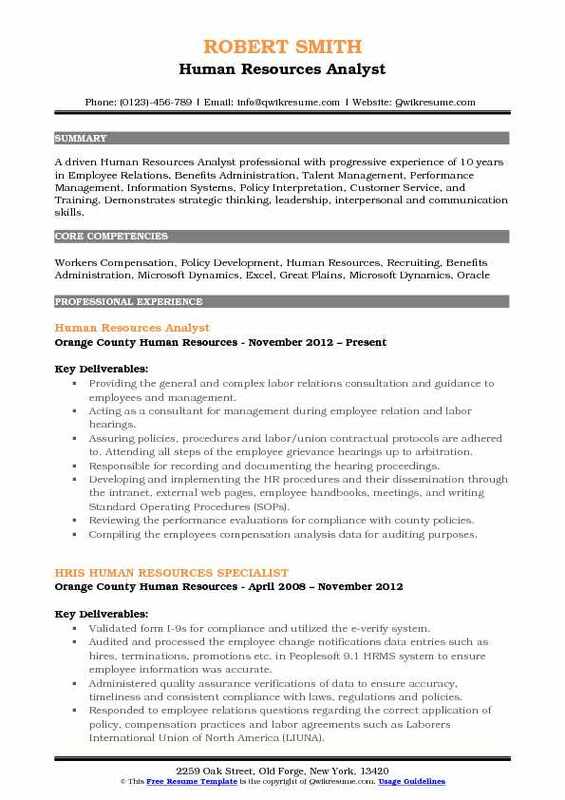 While performing these HR duties, the HR Analyst is supposed to interact with the employees and management with a confident positive note; hence a Human Resources Analyst Resume sample should contain some competencies like business acumen, communicative skill, and ethical practice knowledge. For getting into this job post, the candidate should possess a Bachelors or Masters degree in Human resource or public administration or its related field. 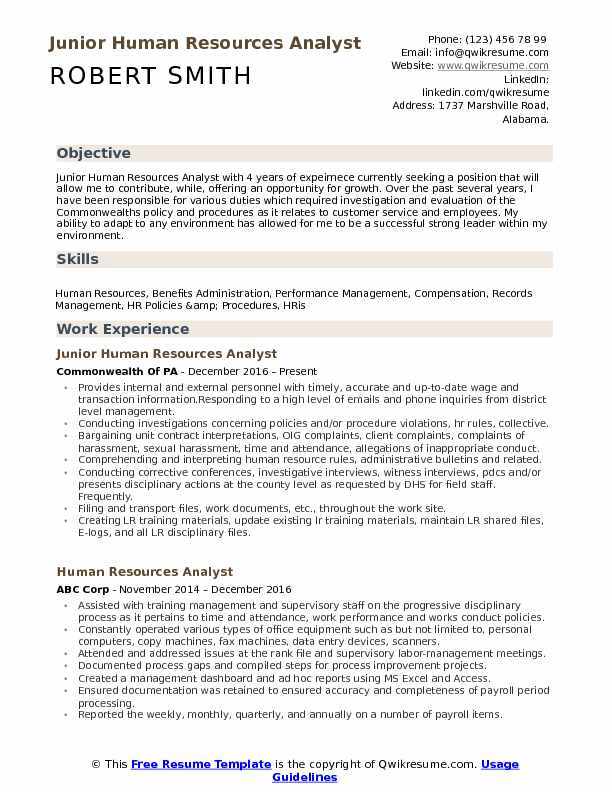 Objective : Junior Human Resources Analyst with 4 years of expeirnece currently seeking a position that will allow me to contribute, while, offering an opportunity for growth. Over the past several years, I have been responsible for various duties which required investigation and evaluation of the Commonwealths policy and procedures as it relates to customer service and employees. My ability to adapt to any environment has allowed for me to be a successful strong leader within my environment. Provides internal and external personnel with timely, accurate and up-to-date wage and transaction information. Responding to a high level of emails and phone inquiries from district level management. Conducting investigations concerning policies and/or procedure violations, hr rules, collective. Bargaining unit contract interpretations, OIG complaints, client complaints, complaints of harassment, sexual harassment, time and attendance, allegations of inappropriate conduct. Comprehending and interpreting human resource rules, administrative bulletins and related. Conducting corrective conferences, investigative interviews, witness interviews, pdcs and/or presents disciplinary actions at the county level as requested by DHS for field staff. Frequently. Filing and transport files, work documents, etc., throughout the work site. Creating LR training materials, update existing lr training materials, maintain LR shared files, E-logs, and all LR disciplinary files. Summary : Human Resources Analyst III with over 22 years of experience in employee relations, organizational development, labor relations, payroll and scheduling, and human resources generalist Innovative professional with expertise in the creation and deployment of instructional programs. Analyzing current human resources and business practices for increased efficiencies and improvements. Analyzing HR system capabilities, identifying process improvements and assisting with implementing streamlined processes, providing needed training for end users. Keeping abreast of current legislation involving employment practices, update programs as required, and training the Managers and Human Resources personnel to remain in compliance. Developing and implementing site affirmative action program. Serve as company liaison with government enforcement agencies with regard to affirmative action and EEO practices. Implemented the payroll audit which decreased payroll errors by 5% by implementing checks/balance through SAP reporting. Implementing the attestation process which aligned with corporate best practice. Managing bi-weekly payroll for hourly represented and non-represented employees and salaried employees. 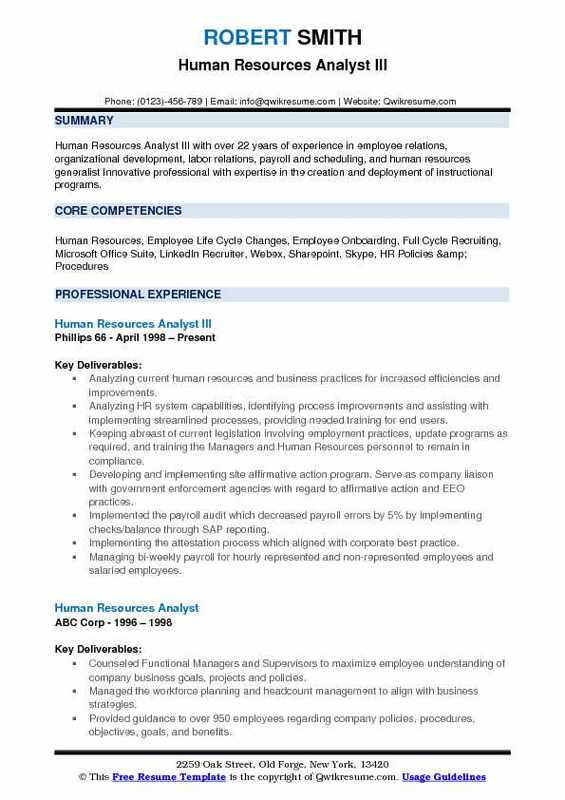 Summary : Human Resources Analyst I with 13 years background in employee management, hiring, training, benefits, policy development and performance management. Highly detail-oriented and organized. Highlights Recruitment/staffing, Interviewing, Benefits administration, Compensation/payroll, Training and development, Employee Coaching, Personnel records maintenance, Employee relations, Hiring and retention, New hire orientation, Exceptional interpersonal skills. Identified and analyzed the problems related to organizational structure, salary levels, classification, examining procedures, and other human resource related activities. Developed and evaluated the alternative methods for solving Human resource issues, prepared reports of findings and recommendations for solutions. Reviewed written classification specifications, analyzed duties and responsibilities for classification purposes, determined and recommended proper allocation of positions. Processed payroll and maintained payroll related records, maintained various leaves and workers compensation records. Reviewed and processed personnel transaction documents, maintained the position allocation records, position history records, and related payroll personnel records. Compiled reports and statistics of payroll and personnel activities. Developed and revised forms. Gathered, tabulated and analyzed the salary and the benefit data required in maintenance or revision of the compensation plan. Objective : An organized, detail-oriented, and conscientious Jr. Human Resources Analyst with 3 years of experience, able to strategize and prioritize effectively to accomplish multiple tasks and stay calm under pressure. Maintains a positive and professional demeanor at all times. Interprets requests, determines action plan, explain guidelines, policies, and procedures. Possess critical thinking skills, along with attention to details. Skills : Microsoft Office Suite, Budget/Finance Reporting, Database Management, Calendar Management, I-Leave Space Management, Oracle, P-Card Management, Data-Warehouse, Kronos, PeopleSoft, Project/Data Management, HRMS, Presentation, Customer Service. Provided administrative coverage to the Chief Financial Officer, and Executive Director of human resources. Liaised with hiring managers on a daily basis to relay candidate feedback on applicants. Handled all confidential material relevant to departmental/corporate operations; filed and retrieved hr documents, records, and reports. Provided support in all HR areas - HRMS maintenance, employee relations/conflict resolution, new hire orientation, employee onboarding, termination process, recruitment and sourcing, performance management. Assisted with the development and administration of programs, procedures, and guidelines to help align the workforce with the strategic goals of the company. Assisted in developing employee training and onboarding manuals for new hires and assisted in the training of new staff. Managed the development and maintenance of the hr section of both the internet, particularly recruiting, culture, and company information, and intranet sites. Collected, analyzed, and created data reports to present to the executive team and Director of human resources. 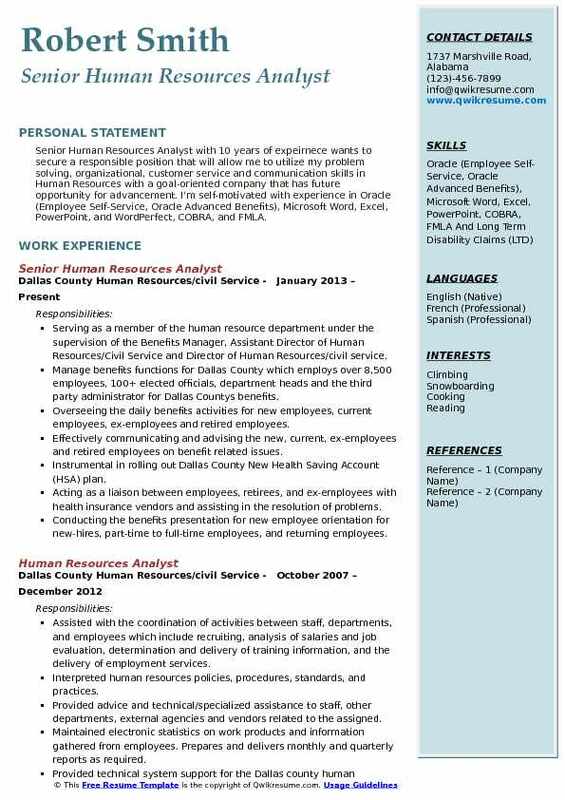 Summary : Senior Human Resources Analyst with 10 years of expeirnece wants to secure a responsible position that will allow me to utilize my problem solving, organizational, customer service and communication skills in Human Resources with a goal-oriented company that has future opportunity for advancement. I'm self-motivated with experience in Oracle (Employee Self-Service, Oracle Advanced Benefits), Microsoft Word, Excel, PowerPoint, and WordPerfect, COBRA, and FMLA. Serving as a member of the human resource department under the supervision of the Benefits Manager, Assistant Director of Human Resources/Civil Service and Director of Human Resources/civil service. Manage benefits functions for Dallas County which employs over 8,500 employees, 100+ elected officials, department heads and the third party administrator for Dallas County's benefits. Overseeing the daily benefits activities for new employees, current employees, ex-employees and retired employees. Effectively communicating and advising the new, current, ex-employees and retired employees on benefit related issues. Instrumental in rolling out Dallas County New Health Saving Account (HSA) plan. Acting as a liaison between employees, retirees, and ex-employees with health insurance vendors and assisting in the resolution of problems. Conducting the benefits presentation for new employee orientation for new-hires, part-time to full-time employees, and returning employees. Effectively training human resources/civil service staff and hr field staff on changes for the upcoming plan year. 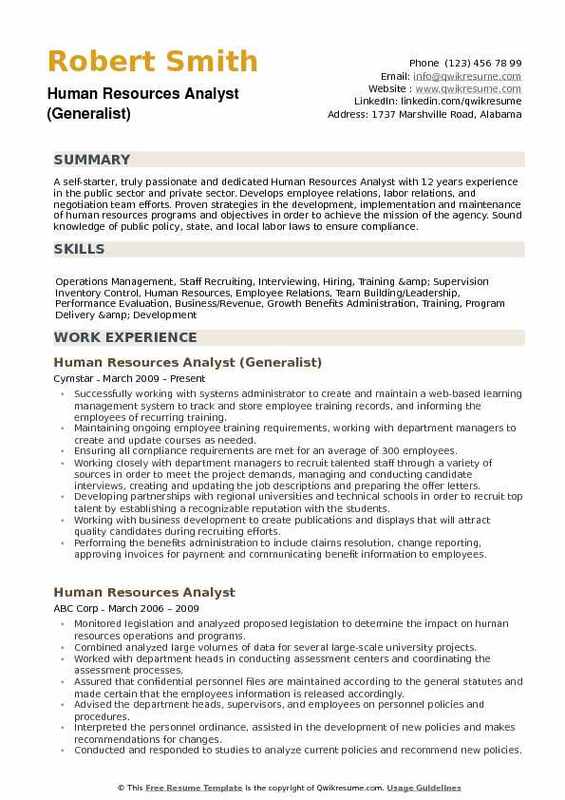 Summary : Metric-driven Human Resources professional with 10 years of experience eager to leverage my analytical skills, experience as an entrepreneur, and MBA education into a management role with your organization. Skills : Key Business Strengths Recruitment & Selection, Performance Management, Employee Relations, Workforce Planning, Change Management, Records Management, Conflict Resolution, Succession Planning, Employee Benefits, Joint Personnel Adjudication System (JPAS), Microsoft Office Suites. Administering all aspects of human resources department activities including processing the department hiring requests, analyzing transcripts and applications. Administering and scoring the employment tests, recording, and tracking the test results, notifying the applicants of results. Conducting references and background checks on final applicants, verifying the work experience for vocational disciplines. Placing the recommended equivalencies on the board agenda for approval of applicants. Notifying the department and hiring committee when successful candidates have been approved for hire. Auditing the transcripts to determine salary placement for faculty and administrators. Monitoring probationary and annual evaluations and notifying the Managers/Supervisors when due. Processing the new employees, providing information regarding compensation and benefits, policies and procedures, and professional development. Verifying the I-9 status; providing fingerprint and TB test information, and ensuring completion of all new hire formalities. Summary : Dynamic, reliable, top-performing, and disciplined Sr. Human Resources Analyst with a solid understanding of human resources, business operations, and various corporate environments. Proven abilities in creatively identifying methods for improving staff productivity and organizational behavior. Recognized for ability to incorporate innovative management techniques into a multicultural workforce. Managing and facilitating the talent acquisition function for TSRI FL location, including collaborating with customers to develop and execute recruitment/sourcing strategy. Acted as an internal consultant to all levels of staff and proactively provided guidance on critical issues surrounding employment, recruitment decisions and growth plans. Partnered with new incoming faculty to assist with ramp up and staff selection. Coordinated and conducted Scripps Florida's employment outreach efforts including college recruitment plans, on-site career fairs, advertisements, and relationships with local universities. Conducted panel presentations and community presentations with local universities and diversity recruitment groups. 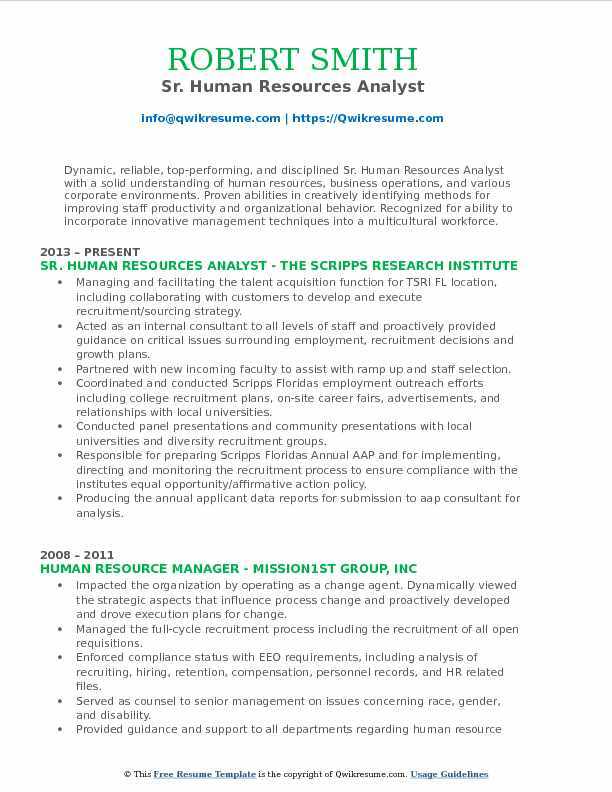 Responsible for preparing Scripps Florida's Annual AAP and for implementing, directing and monitoring the recruitment process to ensure compliance with the institutes equal opportunity/affirmative action policy. Producing the annual applicant data reports for submission to aap consultant for analysis. Developing, implementing and maintaining the good faith effort for outreach programs. 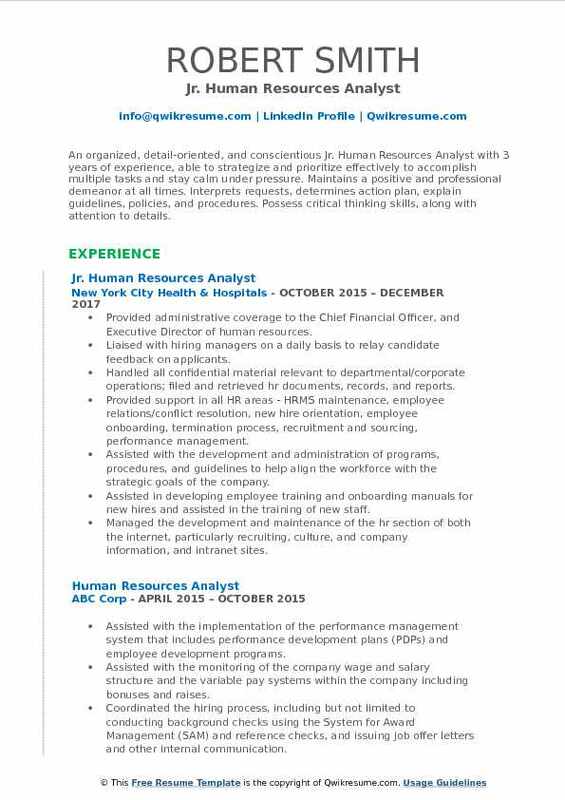 Summary : A driven Human Resources Analyst professional with progressive experience of 10 years in Employee Relations, Benefits Administration, Talent Management, Performance Management, Information Systems, Policy Interpretation, Customer Service, and Training. Demonstrates strategic thinking, leadership, interpersonal and communication skills. Providing the general and complex labor relations consultation and guidance to employees and management. Acting as a consultant for management during employee relation and labor hearings. Assuring policies, procedures and labor/union contractual protocols are adhered to. Attending all steps of the employee grievance hearings up to arbitration. Responsible for recording and documenting the hearing proceedings. Developing and implementing the HR procedures and their dissemination through the intranet, external web pages, employee handbooks, meetings, and writing Standard Operating Procedures (SOPs). Reviewing the performance evaluations for compliance with county policies. Compiling the employees' compensation analysis data for auditing purposes. Interviewing, completing telephone interviews, developing a performance-based interview (PBI). Managing the applicants status through Peoplesoft. AttendING THE job fairs at local universities to promote job opportunities and explain orange county benefits. Coordinating benefits, new hire orientation presentations, enrollment, and acknowledgment. 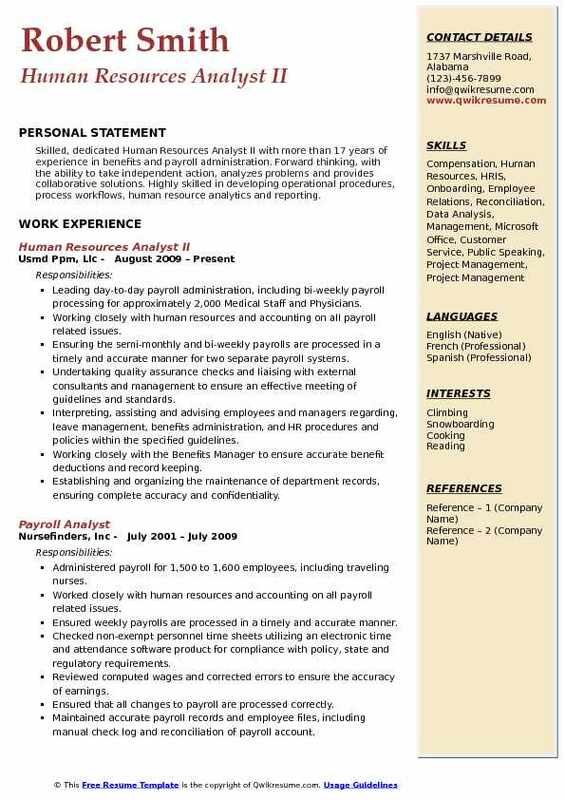 Summary : Skilled, dedicated Human Resources Analyst II with more than 17 years of experience in benefits and payroll administration. Forward thinking, with the ability to take independent action, analyzes problems and provides collaborative solutions. Highly skilled in developing operational procedures, process workflows, human resource analytics and reporting. Leading day-to-day payroll administration, including bi-weekly payroll processing for approximately 2,000 Medical Staff and Physicians. Working closely with human resources and accounting on all payroll related issues. Ensuring the semi-monthly and bi-weekly payrolls are processed in a timely and accurate manner for two separate payroll systems. Undertaking quality assurance checks and liaising with external consultants and management to ensure an effective meeting of guidelines and standards. Interpreting, assisting and advising employees and managers regarding, leave management, benefits administration, and HR procedures and policies within the specified guidelines. Working closely with the Benefits Manager to ensure accurate benefit deductions and record keeping. Establishing and organizing the maintenance of department records, ensuring complete accuracy and confidentiality. Preparing, reviewing, interpreting, and analyzing a variety of data, information and reports, and making recommendations depending on findings. Proficient in Human Resource Systems Reporting, generating various on-demand reports for internal and vendor use. Summary : A self-starter, truly passionate and dedicated Human Resources Analyst with 12 years experience in the public sector and private sector. Develops employee relations, labor relations, and negotiation team efforts. Proven strategies in the development, implementation and maintenance of human resources programs and objectives in order to achieve the mission of the agency. Sound knowledge of public policy, state, and local labor laws to ensure compliance. Successfully working with systems administrator to create and maintain a web-based learning management system to track and store employee training records, and informing the employees of recurring training. Maintaining ongoing employee training requirements, working with department managers to create and update courses as needed. Ensuring all compliance requirements are met for an average of 300 employees. Working closely with department managers to recruit talented staff through a variety of sources in order to meet the project demands, managing and conducting candidate interviews, creating and updating the job descriptions and preparing the offer letters. Developing partnerships with regional universities and technical schools in order to recruit top talent by establishing a recognizable reputation with the students. Working with business development to create publications and displays that will attract quality candidates during recruiting efforts. Performing the benefits administration to include claims resolution, change reporting, approving invoices for payment and communicating benefit information to employees. Planned and developed payroll processes and procedures to accurately pay employees in a multi-location, multi-state environment;.